The Diva assigned us the pattern of “Rain” for this week’s challenge. Never used it before, so looked it up and practiced a bit. Kind of like it – sometimes these types of patterns are too “rigid” for me. I like the more organic, curvier shapes. I decided to try another pattern that I’ve never used before and add to this tile. Here is my entry for this week using Rain, Phicops, Msst and Sand Swirl. To see lots of creative pieces from others, head over to the Diva’s website for the other entries to Challenge #168. 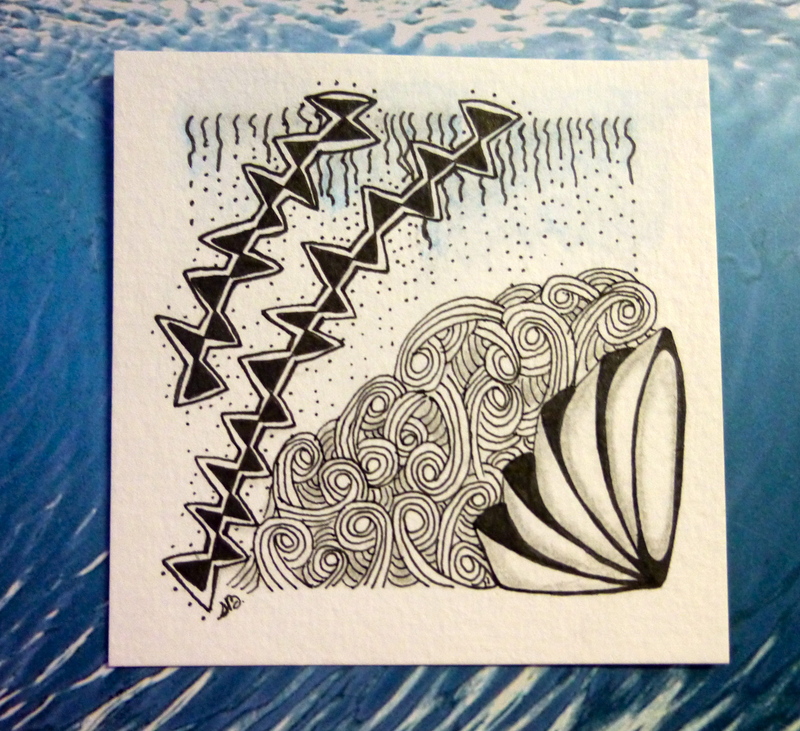 ← A Little Sunday Zentangle …. Thanks for the suggestion … will give it a try! Love how it like rain over the sea! I like the msst and rain together. definitely an ocean scene! Great combination of Msst and Rain. Fits with a seaside theme. Msst and Rain are made for eachother! You made a lovely tile. nicely done. i agree with earlier comments, that Msst just wants to play with Rain. Your tile is lovely! I used Msst on mine as well, but very differently from yours. Isn’t is fun to see all the ways people use the same things? Thanks for sharing.